What Are The Top Rated Animal Themed Online Slots? Animal themes have fascinated online slot players ever since they appeared in slot games. Today there are hundreds of animal themed slot machines to choose from, with each of them coming with different features. Here we have created a list of the best of them so that you would be able to select the animal themed slot machine with the features you love. We have played these games for long durations, analysed them, and ranked them based on many factors including graphics, layout, RTP, ease of play, rewards, bonus features, and user comments. We hope this list would be of assistance to you in deciding which games would be ideal for you. With a maximum bet of £250 at an RTP of 95.4%, Wonder Hounds slot game is for the high roller as well as the pet lover who wishes to see how much luck he brings in. There is a Wild symbol that helps you land more winning combinations, and a Scatter that awards you Free Spins. The Wonder Hounds Gone Wild feature would occur randomly during the base game and the Free Spins and award you prizes at any time. There are 25 paylines to win a prize in this slot machine we have ranked number 5 in our list. These 7 Piggies uk slot with 7 paylines would bring you some sizable prizes if you choose to spin them. The RTP of 95.99% is definitely above average, and there are also Stacked Wilds and other stacked symbols too. You will get the chance to reveal Free Spins that can be re-triggered, and Multipliers if those are the features you would like to see in a game. Regular symbols come with a maximum multiplier of 1500x. You will find some of your favourite dog breeds in this slot machine that comes with 15 paylines on an RTP of 95%. There are also 15 Free Spins that pay 3x prizes. A Gamble feature is also available if you are playing for big wins but the upper limit of the Gamble is £32,000. The Wild symbol would stand for all regular symbols. Whether it is entertainment or big money you are playing for, you will not be disappointed with what Doting Doggies online slot offers you. 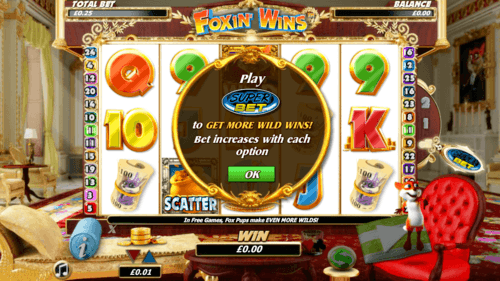 With an RTP of 95.33% and 25 paylines, Foxin' Win online slot game has a good balance between rewards and entertainment. A Wild and a Scatter are the regular Bonus symbols you find here as in many other slots, but additionally you will find Super Bet Feature, Fox Funds, and Leprechaun Shakedown that adds to fun as well as your chances of a win. The Scatter awards 10 Free Spins, while in the Leprechaun Shakedown, the fox might catch the leprechaun and empty its pockets leaving the money for you to collect. Let the Big Bad Wold ransack the reels so that you would find sizable prizes every time he searches the barn. With its RTP of 97.34%, Big Bad Wolf slot rewards you far better than the average slot machine when you play long times. The Swooping Reels feature brings in more wins after a win by replacing winning symbols with other symbols for yet another win. Pigs Turn Wild feature brings in more winning combinations while the Free Spins award you even more chances of finding your luck. If it is the Blowing Down the House that is activated, do not run away because this feature means more prizes coming your way.